18 months & up. 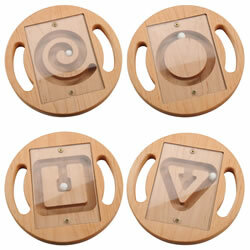 These four wooden ball mazes help children learn to visually track moving objects as the ball rolls around the maze. As they play, children will begin to anticipate the path of the ball as they develop critical thinking skills. Designed with large handles for children to easily grasp and manipulate the ball around the maze. Set includes a spiral, circle, triangle, and square. Each measures 8" in diameter. 18 months & up. A classic 7-piece puzzle with a fun twist. Children will love this Construction Puzzle and its extra spinning features. Puzzle measures 8 1/4"L x 9 1/2"H x 1"H.
18 months & up. 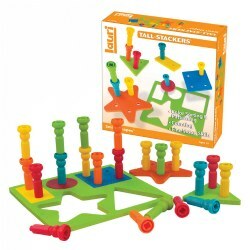 A classic 8-piece puzzle with a fun twist. Children will love this Vehicle Puzzle and its extra spinning features. 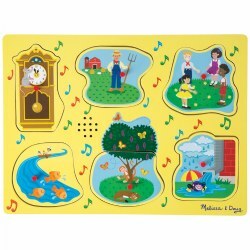 Puzzle measures 8 1/4"L x 9 1/2"H x 1"H.
18 months & up. Pick a strategy for matching...colors or sizes! 5 circles in 5 sizes and colors fit easily into matching color-inlaid wells. Jumbo knobs make pieces easy to grip and manipulate. 2 years & up. 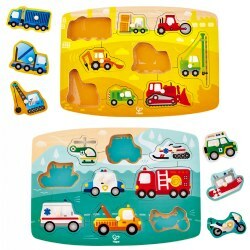 Learn about the different kinds of vehicles you may encounter with this colorful and engaging puzzle set. Includes Construction and Emergency Puzzles. 1 year & up. 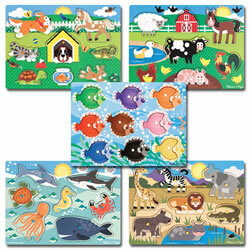 Young children will build both fine motor and cognitive skills while enjoying the familiar animals on this knobbed puzzle set. 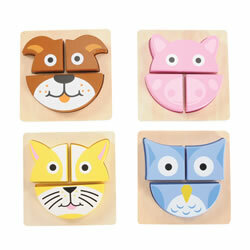 Each puzzle includes four animal pieces with knobs for easy handling. 1 year & up. 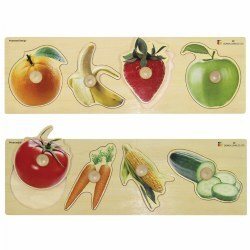 Promote healthy food choices while strengthening fine motor skills with this vibrant fruit and vegetable puzzle set. 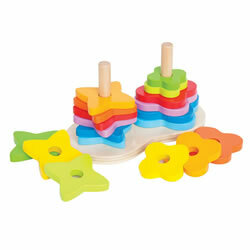 Each puzzle has large knobs perfect for little hands to grasp. 2 years & up. 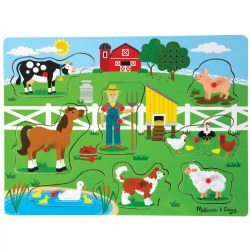 This eight-piece farm puzzle has small knobs for easy removal and placement. Help the animals help Old MacDonald complete the classic song! Directions and lyrics are included on the puzzle. Requires AAA batteries (not included). Measures 11 3/4" x 8 3/4" x 3/4". 12 months & up. 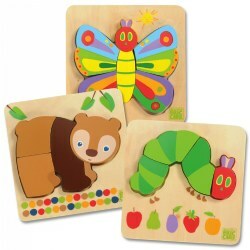 Solid wood puzzles have chunky 1/2" thick pieces and make perfect first puzzles. Large knobs make it easy for small hands to remove each brightly colored piece and features matching pictures underneath. Problem Solving: Introduces logic, matching, spatial relationships, critical thinking, and an understanding of cause and effect. 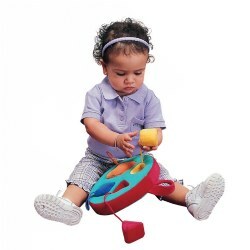 Fine Motor Skills: Promotes dexterity, hand/eye coordination, and manipulation. 18 months & up. Toddlers will explore the world around them through this set of beautifully illustrated puzzles from The World of Eric Carle™. 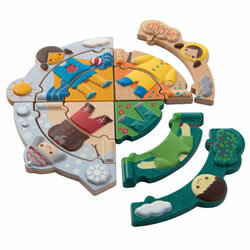 Each puzzle is made up of four chunky, wooden pieces. Puzzles measure 5.65"W x 5.85"H each. 18 months & up. 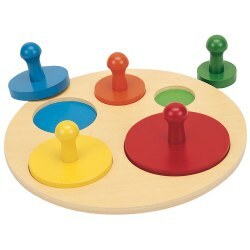 Identify colors and shapes by placing brilliantly colored geometric pieces with jumbo knobs in corresponding spaces. Measures 8 3/4" x 8 3/4" x 1/2". 2 years & up. 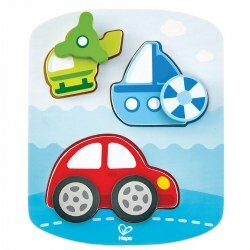 These chunky puzzle pieces are sized just right for little hands. 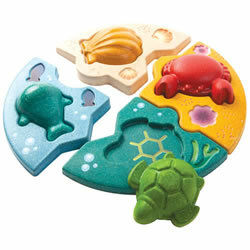 Each colorfully hand-painted puzzle piece is individually shaped so that even the youngest child can be successful! 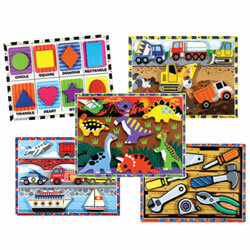 Set includes tools, transportation, construction vehicles, dinosaurs, and basic shapes. 12"W x 9"D.
12 months & up. 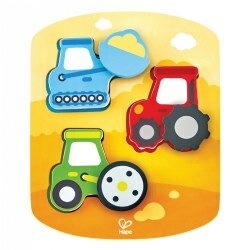 Young children will build both fine motor and cognitive skills while enjoying the familiar animals on this knobbed puzzle set. 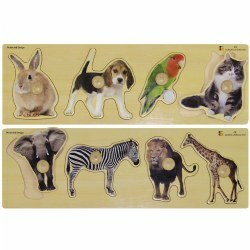 Each puzzle includes four animal pieces with knobs for easy handling. 12 months & up. 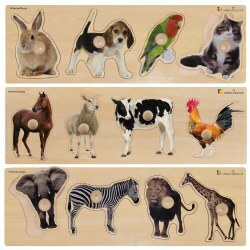 This animal-themed puzzle set was designed with toddlers in mind. The bright colors and bold features will hold a toddler's attention. The animals are printed on the base for a visual clue, and the three chunky pieces are easy for toddlers to hold and grasp. Each puzzle measures 5 1/2" x 5 1/2". Set of 4. 2 - 5 years. 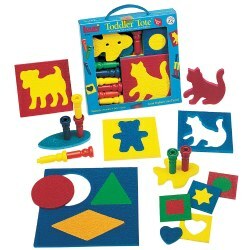 Toddler Tote™ promotes color and shape recognition, concentration, fine motor and eye-hand coordination. Made of crepe rubber, it's safe, quiet. Surface washable. 2 years & up. 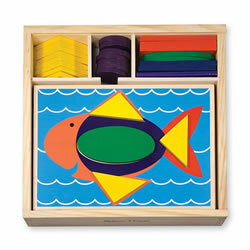 From colorful fish to safari animals, this set of familiar themed peg puzzles make the perfect starter set for any classroom. 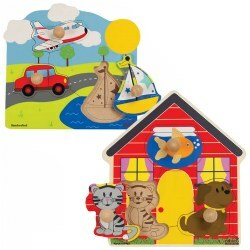 They feature easy-grasp pegs, wooden construction, and visual clues under each piece. 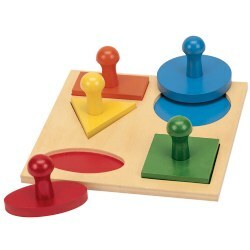 Promotes hand-eye coordination, fine motor development, and problem solving skills. Each puzzle has 6-9 pieces.